This adorable little stuffed chicken from Wild Republic's Hug'ems collection is just clucking to accompany you on all your imaginative adventures. 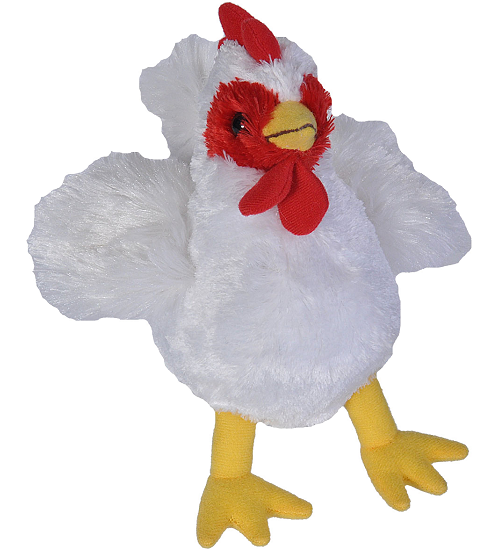 With soft white fur, yellow beak and feet, and vibrant red comb and wattle, this plush chicken has a huggable body for hours of cuddly fun. 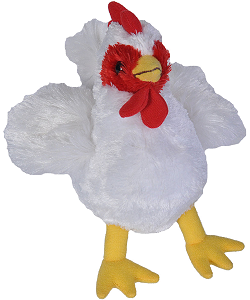 In addition, a portion of the proceeds from the sale of this cuddly chicken helps support foundations which provide housing and education for disadvantaged children, as well as protection for abandoned animals throughout the world. Mini Flopsie Toro, this cute little stuffed bull, has a huggable understuffed body giving him the flexibility to sit, stand, or lie down.